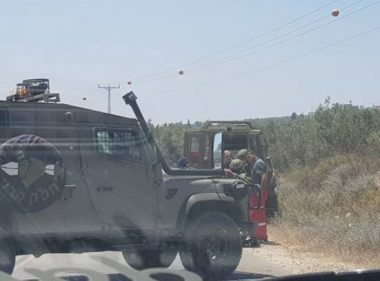 Israeli soldiers invaded, Monday, the town of Barta’a ash-Sharqiya, west of the northern West Bank city of Jenin, and summoned the owners of twelve Palestinian homes and five stores, for interrogation in Beit El, near Ramallah in central West Bank, allegedly for building without permits. Tawfiq Kabaha, a member of Barta’a Town Council, said the soldiers, and personnel of the Israeli “Construction and Planning Committee,” took pictures of two homes, owned by Mohammad Wasfi Kabaha and Falah Hasan Kabaha, in the al-Wad area, and summoned them for interrogation in Beit El, near Ramallah. Kabaha added that the soldiers also summoned the owners of ten homes, and five stores, for interrogation in Beit El. The army claimed the constructions were done without permits from the Israel “Civil Administration Office,” run by the military in the occupied West Bank. Barta’a largely falls in “Area C” of the occupied West Bank, under full Israeli military control. The village, surrounded by the illegal Annexation Wall, lost thousands of Dunams of Palestinian lands to the wall itself, and the illegal colonies. Almost all construction applications filed by the Palestinian, to build on their own lands in Area C, are denied by the Israeli authorities, an issue that forces dozens of expanding families to build without permits to accommodate their expanding families. Meanwhile, all of Israel’s ongoing construction and expansion of illegal colonies in the West Bank, including in and around occupied East Jerusalem, and the Annexation Wall, continue to deny the Palestinians their basic rights, to build on their lands, in addition to the illegal annexation of their lands, while vast areas of agricultural farmlands and orchards, remained isolated.